My database in SQL Server 2008 and the backup file is in 2005. I too came across this issue. Don't create an empty database and restore the .bak file on to it. 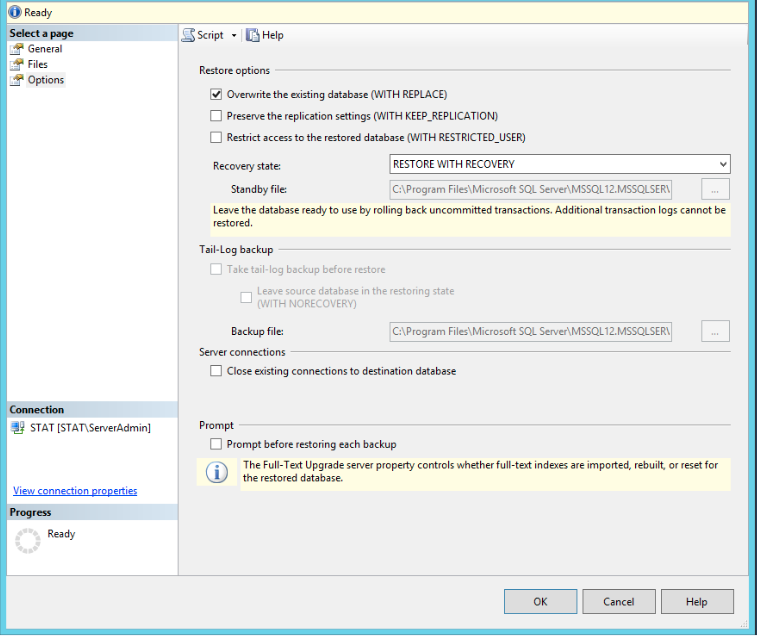 Use 'Restore Database' option accessible by right clicking the "Databases" branch of the SQL Server Management Studio and provide the database name while providing the source to restore. Also change the file names at "Files" if the other database still exists. Otherwise you get "The file '...' cannot be overwritten. It is being used by database 'yourFirstDb'". 1) Use WITH REPLACE while using the RESTORE command. 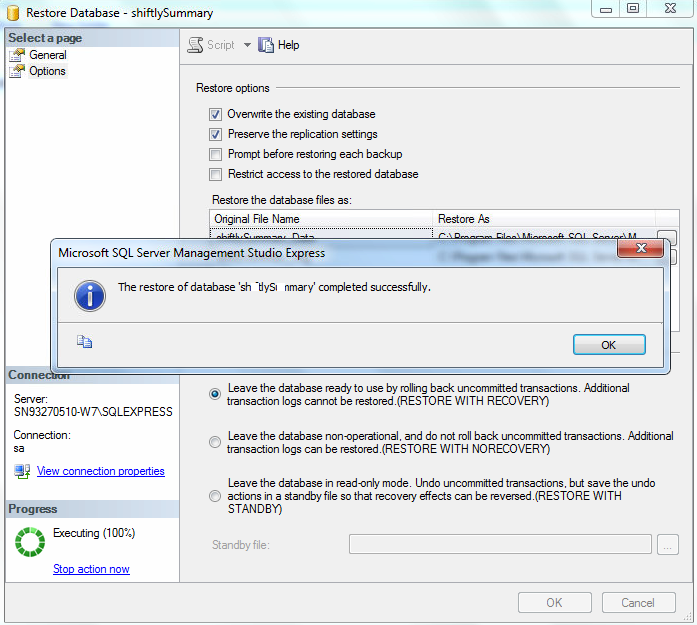 2) Delete the older database which is conflicting and restore again using RESTORE command. Its because the .mdf and .ldf Files from the original Db were locate at maybe c:\programFile\.... and this info is saved in the Backup! If you create the same DB on a different SQL Server where the installation is on c:\program Files (x86)\ .... you can not restore as usually. You need to relocate the path for .mdf and .ldf Files. click on Files at left side > Select "Relocate all Files to Folder"
check close Existing connection to destination database. other options are really optional! I had ran into similar problem today. Tried all the above solutions but didn't worked. So posting my solution here. Hope it help others too! 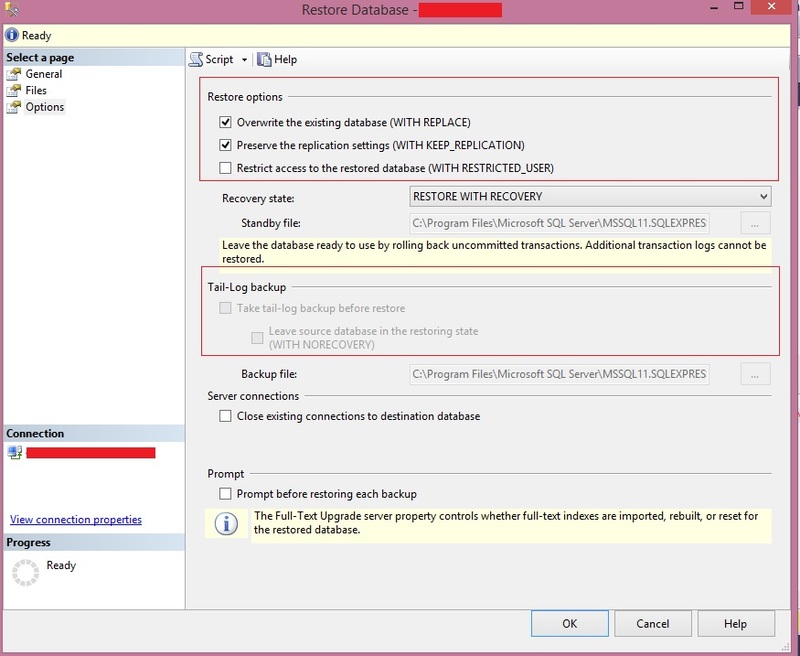 More info on RESTORE FILELISTONLY can be found from the SQL Server docs. Also as important is to make sure that, your database name matches the data base name in the backup you are trying to restore. If it does not match, you will get the same error. 1) Don't Create a database with the same name or different database name !Important. 3) Under "Source for restore" select "From Device"
8)Now Click on Ok Button ,it will create a new Databse and restore all data from your .bak file . Before doing anything else, confirm if your backup is Full or Differential. If you're trying to create a new database out of a differential backup, no matter what you do you will encounter the error. Select tasks, select restore database. Check first option OverWrite the existing database(WITH REPLACE). Go to General, select source and destination database. I was just trying to solve this issue. I'd tried everything from running as admin through to the suggestions found here and elsewhere; what solved it for me in the end was to check the "relocate files" option in the Files property tab. I had to create new db on my local for testing & i had a back up from my prod. I created the db first and tried to run the BAK on top of the new db which produced this error for me. I deleted the db and restored it while sourcing the new db name in the restore screen itself. The db was automatically created on restore. I got work done through alternate way, using Generate scripts. That did work for me as Backup-Restore didn't help to resolve the issue due to same error. Some of you have highly over complicated this. I found this to be extremely simple. 6) Under "Select a Page" on the right Select "Options"
Now Go back to the General page and click OK to restore the database...That is it. In the Options, change the "Restore As" file name to the new database mdf and ldf. It is referencing the source database .mdf and .ldf files. Im sure this problem is related to the files and folders permissions. I was trying to restore a production database to a staging database on the same server. The only thing that worked in my case was restore to a new blank database. This worked great, did not try to overwrite production files (which it would if you just restore production backup file to existing staging database). Then delete old database and rename - the files will keep the new temp name but in my case that is fine.